Seabrook - 1 The Esplanade. This near-new beachfront bach, completed in 2012, has immediate beach access and wide sea views. - proximity to the surf club for safe patrolled swimming. 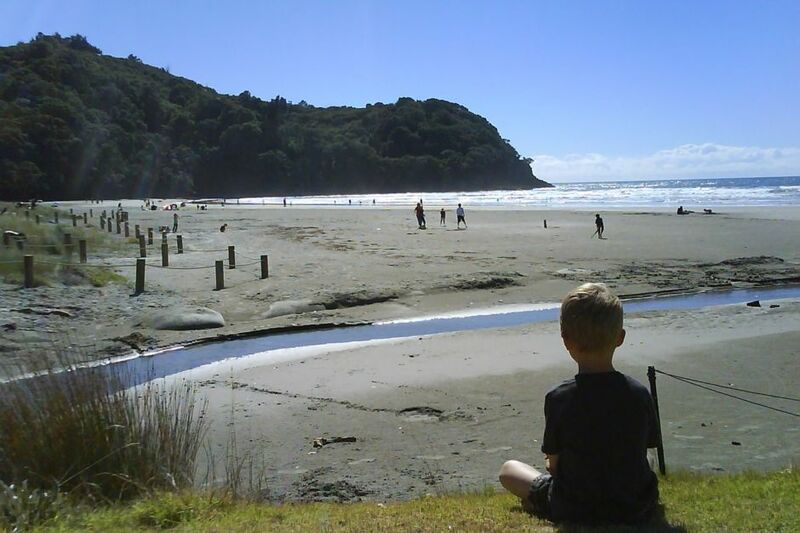 - all-tide beach access (some parts of Waihi Beach lose beach access at high tide). - renowned surf breaks - ride 'the escalator'. - clean stream adjoining the property - a magnet for younger children. - start of the scenic 40 minute walk to Orokawa Beach. - two cafes in walking distance - 5 minutes to the Hot Pipi - or 10 minutes along the beach to the Flat White. - large (approx 70 sq m) open lounge / dining / kitchen area. See it all from the lounge, deck or lawn - surfing, swimming or watch the kids pottering in the stream. - Linen and towels - BYO preferred. Can be supplied by arrangement. - Please remove own rubbish. Collection day is Monday. - BBQ - Charcoal. No guarantees re: how clean the last user left it. Please clean after use. - TV - freeview dish and box. See 'Rental terms' for policy on weddings/events, parking and consumables. Close to surf club, patrolled swimming area, surf break, stream, and walk to Orokawa Beach. Our Family had the most amazing time at the house, so close to everything and it has a really great atmosphere.We would definitely stay again and highly recommend to others. Our family enjoyed our stay at Seabrook this weekend. What a location! We slept to the sound of the ocean at night and we appreciated the magnificent beach and ocean views by day. The house was clean and tidy and we found that it was a nice space for a family to hang out. We were a party of 7 adults and 2 children and the beds and bedding were very adequate. It has a good kiwi family holiday home feel. We all agreed that it was a great relaxing place to holiday and we'll be booking it again for sure. We love staying at this place, so close to the sea. We will be back again. Location is the only positive feature. Misleading title, it is definitely not “brand new”. The beachfront location is superb. The high end price we paid to stay here gave us an expectation of comfort and cleanliness. We were extremely disappointed. Firstly, the beds are not just uncomfortable but downright appalling. Springs in our backs, very old, and causing sleepless nights. The shower door in the en-suite is broken and both bathrooms have mould, peeling paint and the shower doors look as though they have never been cleaned. Basic homewares were not provided. A house that sleeps 12 should have more than 3 mismatched wine glasses. All surfaces and floors looked like they hadn’t been cleaned in years. Under the beds were thick with dust and the fridge was so unsanitary it needed a clean on arrival. The front lawn was the only access to the beach and was full of prickles and hasn’t been mowed in weeks. We were also asked to find alternative accomodation half way through our stay due to a “muck-up” in the bookings. We settled on leaving a day early with two days refund. With new beds, repairs, a “deep” clean and purchasing some basic homewares this Bach could reflect the high end pricing and ensure we returned many times. Both families could have had the best summer holiday ever, instead we were left feeling ripped off and frustrated. We see from previous reviews you have ignored all this feedback. Please do not ruin anyone else’s holiday. This beach house proved ideal for our family stay at Waihi beach. Its light filled very large living room and deck right on the beach front provided perfect indoor outdoor living. The five bedrooms gave plenty of privacy. We had a great kiwi beach holiday holiday here. Good location, very close to the neighbors. House was modern and good views. However, two people badly bitten by fleas, from one of the bedrooms. Would go again if flea issue was resolved.